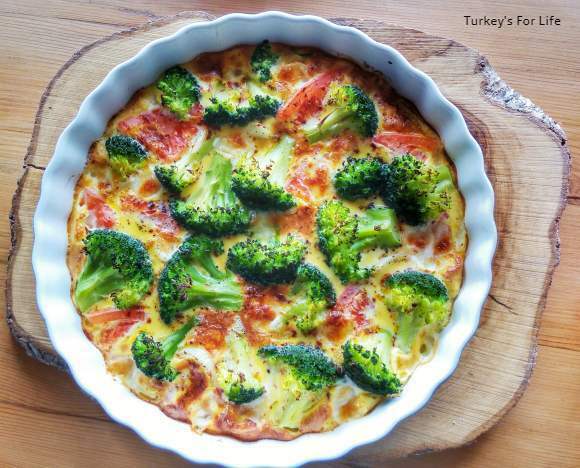 Turkey ▸ Food & Drink ▸ International Recipes ▸ Broccoli Frittata Recipe – Fantastically Simple But Oh So Tasty! Most of the recipes on this blog are Turkish recipes. You know, what with us living in Turkey and everything. We do, occasionally, however, cook dishes of the non-Turkish variety. And more often than not, these dishes will not make it onto these online pages. But there are always exceptions. This broccoli frittata recipe is one of those exceptions. Throughout winter, broccoli becomes a bit of a staple and we’re always looking for inventive ways to use it. Obviously, broccoli soup is always going to be a warming comfort blanket in the colder months but broccoli is such a handsome vegetable, too. We love dishes where it can stand out as the star of the show – and this broccoli frittata allows for just that. When I first made the broccoli frittata, we were going in for an all out healthy recipe but, of course, little extras slip in there from time to time, too, now. If we’re feeling a bit more indulgent, we’ll make a blue cheese and broccoli frittata. Whatever cheese is in the fridge at the time. It could be kaşar or beyaz peynir (think feta). But, the cheese is definitely optional. So, how did a playing-around-in-the-kitchen lunch become a recipe on the blog? Because of the response. I often take quick photos of random daily goings on to add to our Instagram Stories. Broccoli frittata was one of those photos and, to our surprise, it generated lots of comments and recipe requests. A while later, we posted a couple of our broccoli frittata creations onto our Instagram feed and, again, they generated comments and questions. So, here it is. Certainly not a Turkish egg recipe but we’re using quality Turkish ingredients, and this blog is about our life in Turkey. Life in Turkey sometimes involves international recipes as well as our Turkish favourites. This was a make-it-up-as-you-go-along recipe, but, obviously, there are oodles of broccoli frittata and broccoli omelette recipes out there. If you want to keep things seasonal, as springtime approaches, the broccoli can be replaced with asparagus. With most frittata recipes, your fillings are added to the oven dish and then the whisked egg is poured over the top. With our broccoli frittata recipe, as mentioned above, we want the broccoli to be the star. So, the egg goes into the oven dish first. After being blanched for a few minutes, the broccoli florets are then arranged in the egg mixture, along with your added extras. A light drizzle of olive oil over the top and your florets are vibrant green and just waiting for that roasted crispiness to occur in the oven. So, let’s make our broccoli frittata – and add a little extra indulgence by way of cheese! This easy cheese and broccoli frittata recipe is both tasty and healthy. Serve on its own or as part of a larger meal. Meanwhile, add your broccoli florets to boiling water and blanch for 3-4 minutes. Run them under cold water before leaving to drain. Now add your whisked eggs to a shallow oven proof dish (our oven dish has a 28cm diameter). Scatter your onion into the mix and then place your broccoli florets around the dish. Now add your tomato and cheese, one piece at a time to create an even spread. Sprinkle the top with paprika, salt and pepper. Drizzle a little olive oil over the top of your florets so that they roast in the oven. Place your broccoli frittata in the centre of your oven and bake for around 25-30 mins until your egg is firm all the way through. Your broccoli frittata can be served straight from the oven or left to cool. As with all of our recipes, the calories in this cheese and broccoli frittata recipe are meant as a rough guide. Calories will differ due to quantities and the types of cheese you use - if any. Try to keep your broccoli florets slightly larger than bite-size so that they don't completely submerge into your egg mix. This broccoli frittata recipe can be used to serve four people if you are eating it with accompaniments. And that’s how we make our cheese and broccoli frittata. When the topping is golden and the egg is set all the way through (you can use a knife to pierce the top and check the centre), remove from the oven. At this point, you can either leave your frittata to cool or you can eat it straight from the oven. We prefer the latter, especially if cheese has been added. It’s still oozy at this stage. And why cubes or chunks of cheese rather than grated? Because we love just getting hit with the occasional burst of strong cheese flavour rather than the whole frittata tasting of cheese. Remember, this is a frittata that allows the broccoli to take centre stage. Depending on the style of your shallow oven proof dish, you may need to grease it it with a little oil or butter before you add your mixture. When you are cutting your broccoli florets, keep them on the larger side of bite-sized so that they don’t completely submerge in your egg mixture. For reference, our oven dish has a diameter of 28cms. If you let your frittata go cold, it makes a great picnic snack when cut up into small pieces. We sometimes take food like this with us when we are doing walks around Fethiye. Was just sitting here wondering what to do for lunch. Got a gorgeous head of bio broccoli yesterday, begging me not to mush it up into soup 😉 Thanks for this recipe. I will make it in an hour or so, with some small chunks French Roquefort. I love your recipes!